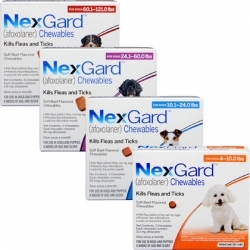 NexGard contains a brand new ingredient not used in any other flea and tick protection. Afoxolaner, the ingredient in NexGard, works by absorbing rapidly and safely into your pet's bloodstream and causes uncontrolled activity the flea's and tick's central nervous system, which causes death. Afoxolaner is slowly excreted through your pet's metabolism, which allows NexGard to continue to provide effective treatment for a full 30 days. This means amazing protection in a tasty morsel! NexGard is a prescription-only medication, so talk to your vet. 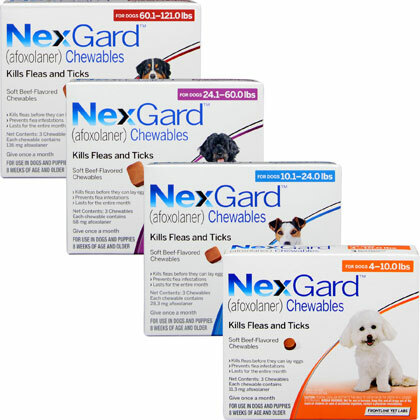 NexGard kills adult fleas and is indicated for the treatment and prevention of flea infestations (Ctenocephalides felis), and the treatment and control of American Dog tick (Dermacentor variabilis) infestations in dogs and puppies 8 weeks of age and older, weighing 4 pounds of body weight or greater, for one month. Give appropriate dosage based on your dog's weight. (See How to Use). If it is suspected that any of the dose has been lost or if vomiting occurs within two hours of administration redose with another full dose. If a dose is missed, administer NexGard and resume a monthly dosing schedule. NexGard can be administered with or without food. NexGard should be administered all year-round. Treat all the pets in your home to reduce the risk of a flea infestation.